Click on the image to get to the full article, or read the text (without embedded images) below. Like the games they make, game development studios come in all shapes and sizes. And oftentimes, the reason for creative and commercial failure is the inability of a developer to properly align the vision for their games with their expertise. 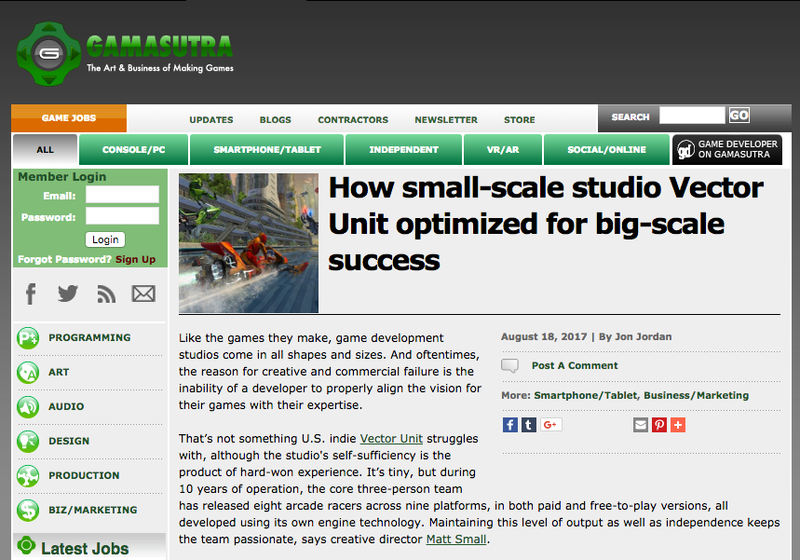 That’s not something U.S. indie Vector Unit struggles with, although the studio's self-sufficiency is the product of hard-won experience. It’s tiny, but during 10 years of operation, the core three-person team has released eight arcade racers across nine platforms, in both paid and free-to-play versions, all developed using its own engine technology. Maintaining this level of output as well as independence keeps the team passionate, says creative director Matt Small. Started out in early 2007, as a duo with CTO Ralf Knoesel, Small admits Vector Unit’s formation was the fulfillment of the pair’s fantasies about “going indie." Now they could finally finish the projects they’d failed to complete after clocking out of their day jobs at EA and Stormfront Studios. But the dream suffered some early difficult moments. “Back then Unity wasn’t around, Unreal was really expensive, and Ralf wanted to do his own engine,” Small says, explaining the decision to roll their own tech. Over the years, Vector Engine has been heavily optimized for the sort of games the studio makes, and has played a significant part in the company’s success, but back to that debut game. Playable prototype complete, Vector Unit went out into the world to find a publisher. Some were keen, but as time dragged on and the Great Recession started to kick in, interest dried up. Thankfully, though, with Microsoft pushing hard on its Xbox Live Arcade service, Vector Unit found an enthusiastic advocate in the form of Microsoft Game Studios’ Peter Choi. Cue months of business negotiation, and prototype reworking, but thanks to Microsoft’s acquisition of the original licence from Warners Bros. (which had picked up the assets of the bankrupt Midway Games), the eventual result was 2010’s Hydro Thunder Hurricane. Released as part of the second XBLA Summer of Arcade, the game went on to sell over 300,000 copies. Vector Unit was up-and-running. “Yeah, we got to make an impression, a splash,” laughs Small. It also proved to be the perfect springboard for Vector Unit’s transition into self publishing and mobile game development. “There weren’t a lot of console-quality 3D games for mobile back then,” Small recalls of his teams 2011 title Riptide GP, its “spiritual successor to Hydro Thunder Hurricane,” which started life as a technology demo for Nvidia’s Tegra 2 chipset. Another water-based arcade racer, the paid title was eventually released for iOS, Android and Amazon Kindle. That was lucky as post-Hydro Thunder, a staffed-up seven-person Vector Unit had spent the majority of its earnings pitching Microsoft new XBLA concepts that came to nothing. Vector Unit carefully considers the cadence of its work, typically following large IP refreshes with shorter projects. Most recently, the approach has seen it release mobile platform racer MouseBot - “a portfolio piece” - before stepping up to start development on its third Beach Buggy game. Debuting with 2012’s Beach Buggy Blitz, the second game in the series, Beach Buggy Racing, was an example of how maintaining its own technology has helped Vector Unit stand out from the pack. Successfully completed within three weeks, the game received considerable App Store promotion, and to-date has generated over 50 million downloads. “Vector Engine has given us opportunities we wouldn’t otherwise have had,” confirms Small, although he adds that the agility it provides in terms of quickly adding new features is balanced by restrictions in terms of overall featureset. And as with Vector Engine, so with Vector Unit. Its small size - artist Elizabeth ‘Timm’ Sewell joined the team in 2012 bringing the headcount to three - provides agility, but limits the complexity of the games it makes. Instead, Small says the company’s way of reducing the risk is by adding platform support to its engine, with Windows 10 being the most recent. This enables Vector Unit to make money across as many channels as possible. For its console releases, PlayStation provides the main revenue stream, followed by Xbox. Of course, it also generates some money from in-app purchases, but an aggressive approach to monetization is neither part of the company’s skillset or inclination. “For a company our size, you can be successful if you stay lean and control your expenses,” says Small. “We can choose to work on what we want, so we make the games that appeal to us; simple and without complex economics." And that philosophy--staying lean, mean, and focused on what you're good at--is a lesson that can apply to pretty much any small team that wants to see success.